A very rare lily that was once classified as being nomocharis, flowers can vary from white to light pink with blackish centers. This photo provided by Alan Mitchell of Scotland was taken in the wild. Exceptionally difficult to grow. 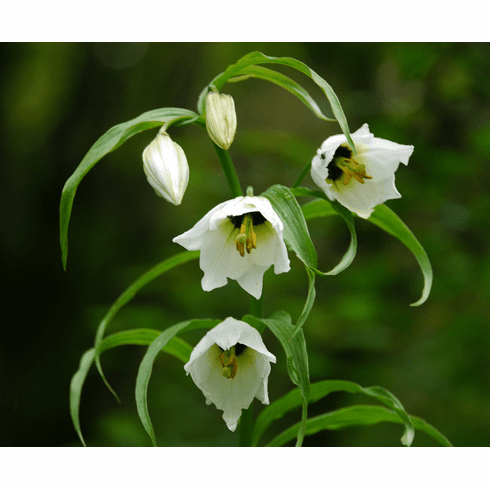 From Pontus Wallsten while corresponding about this lily, he said "I had a discussion a while ago with Yijia Wang (of China) who believes that the white sp that Bjornar Olsen calls henrici which he saw with Alan might in fact be a different, possibly new species unless there is variation within the species. "The fact that Alan's henrici does not fully reflex is the strange thing". Photo insert is of L. henrici flowering in Alan's garden. Photo coypright Alan Mitchell, all rights reserved. Used with permission.